With a little regularity, your personal yoga practice develops all of the best of both routine and creativity. However, from this comfortable pose, you might find yourself thinking "but what if I do that other pose from here?" or "what if I reach my arm over there?" --often, from within a familiar pose, I find myself spontaneously thinking of a new variation or modification. Shoulderstand is one of those traditional poses that offer a plenitude of possibilities once you feel safe and comfortable there. Here are 7 of my favorite variations to help launch you into your own creative yogic path! If shoulderstand is new to you, please do read my recent blog post for lucy activewear first: safe yoga is happy yoga! 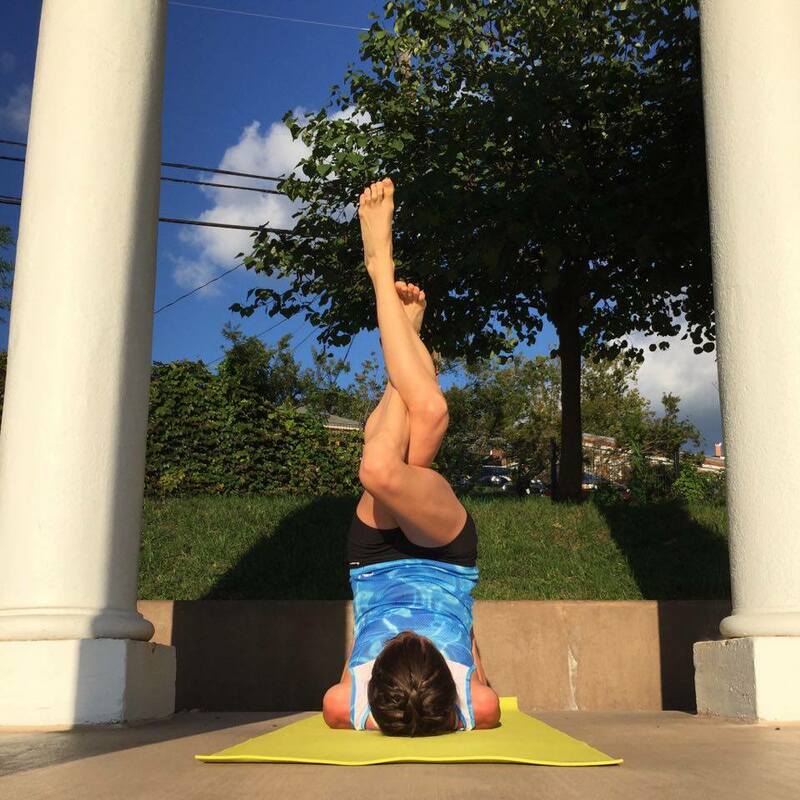 Even if you regularly practice shoulderstand, consulting “Tips for Practicing Shoulderstand” may be a helpful refresher! Remember: no looking around or turning your head! Bad for your neck! Keep your neck happy! Here's also a short video so you can see the full shoulderstand to plow to fish pose (to flying fish) sequence. 1. “Candlestick.” Cross one foot over the other. Press gently through the ball of the top foot and slightly squeeze your legs. Pause for a few breaths and then switch sides. 2. Eagle (Garudasana) Legs. Cross right thigh over left. Continue wrapping right leg around left to send toes around the back of your calf, or, just point your toes where you’d like them to go. (FYI: whether you can fully wrap your toes around your calf is highly dependent on leg length so don’t worry if it’s not working for you!) Gently squeeze legs. Pause and breathe. Unwind legs, then wrap back up the other way with left leg on top. 3. Bound Angle (Baddha Konasana) Legs. Connect soles of the feet, then mindfully lower heels towards your bum. 4. Middle split. Be sure hands are supporting back well for this one. 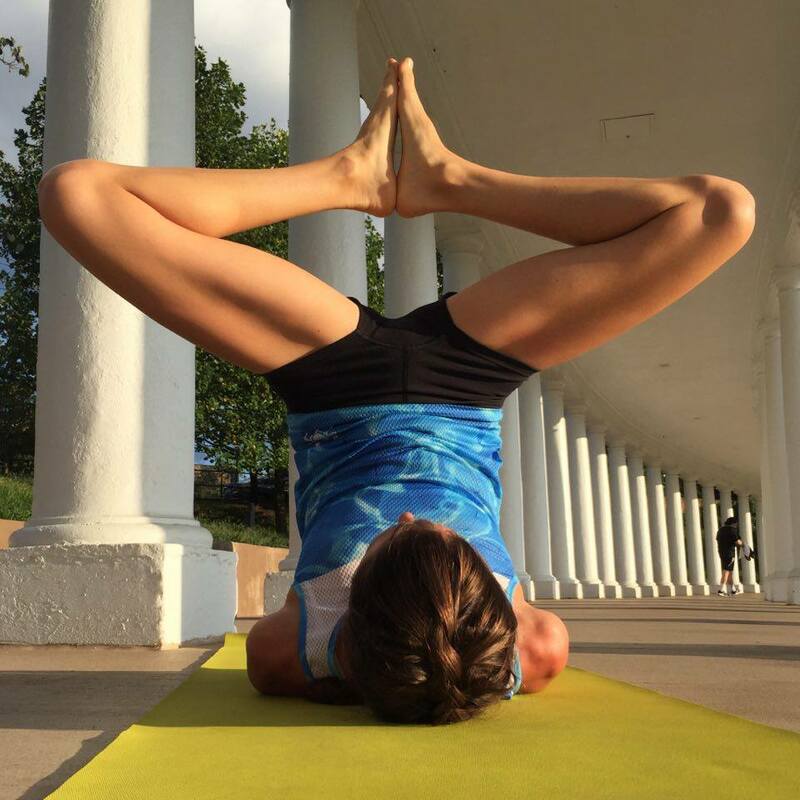 From your usual position with both legs up, let both feet drop directly to either side. Let gravity help you out! This one can be a fun alternative method to work on your seated middle split too! 5. Side splits. Keep one leg in the air in its usual shoulderstand position. 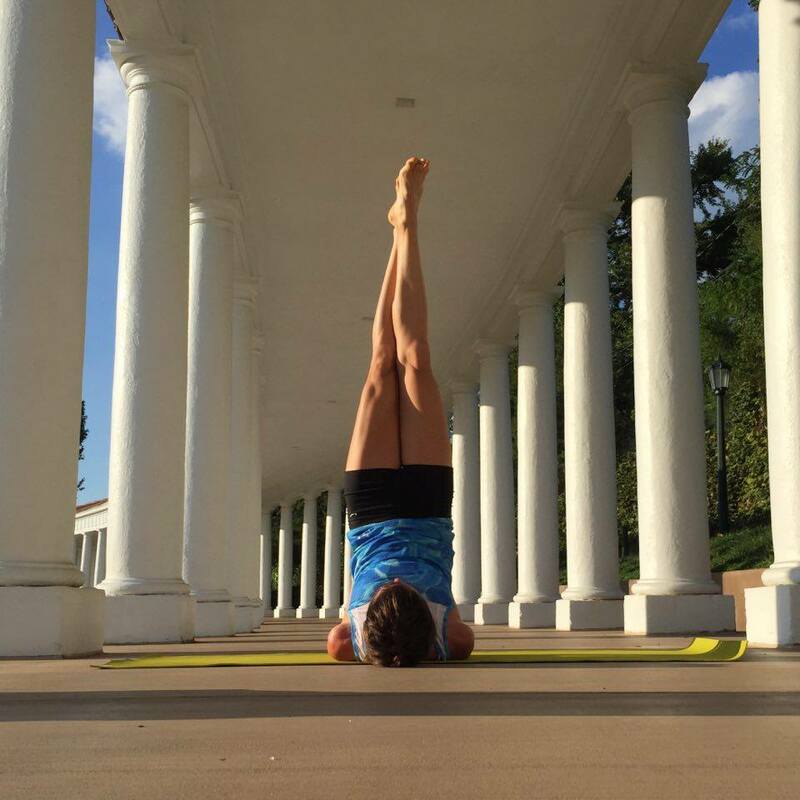 Exhale to mindfully drop one leg over your head (as if it were coming into plow pose). Only go as far as it comfortable, maybe lightly tapping or resting toes on the floor. Inhale leg back up and repeat on second side. Once my foot is as low as I want it, I also like to bend my top leg knee to let toes drop to the floor--this can be a nice, subtle (or sometimes not-so-subtle) quad stretch. 6. Lotus (Padmasana). You should be comfortable in lotus in a regular seated position before attempting an inverted one. (But if you’re not, you should keep reading on to number 7 listed here!) Bring one heel towards your opposite hip. Wedge it there, keeping foot slightly flexed. Now bring other heel towards opposite hip, crossing over other leg to again wedge foot in place. Keep this foot slightly flexed too. As always if you feel any knee discomfort, just don’t do this one! Be sure to practice both sides if possible. If lotus is more accessible on one side than the other for you, just work with what you’ve got—no forcing into lotus! A little bit of practice on the tighter side can go a long way towards evening you out. This is also why it’s helpful to try to practice both sides evenly, perhaps before you begin favoring one side over the other. 7. Half Lotus (Ardha Padmasana). If you’re working towards full lotus in shoulderstand or dealing with one tighter side, you can also practice half lotus. Just keep one leg reaching tall while you fold the other in as described above. This can also be a nice alternative to full lotus, even if that one is part of your repertoire. Think of pressing knee away from you so that it points more towards the ceiling than towards your head. Listen to your body. Yoga is a wonderful way to unlock how great your body can truly feel. It is also a means to being more creative. One of the wonderful things about yoga is that there’s always somewhere else to go: here are 7 of many variations of a shoulderstand. If we’ve got this many options for just one pose, how interesting and energizing might an entire practice be!? You may have heard from those who don’t practice yoga that they think don’t practice because they think it is likely boring; show them this post—yoga is anything but!